Horticulture is the branch of agriculture that deals with the art, science, technology, and business of vegetable garden plant growing. It includes the cultivation of medicinal plants, fruits, vegetables, nuts, seeds, herbs, sprouts, mushrooms, algae, flowers, seaweeds and non-food crops such as grass and ornamental trees and plants. It also includes plant conservation, landscape restoration, landscape and garden design, construction, and maintenance, and arboriculture. Inside agriculture, horticulture contrasts with extensive field farming as well as animal husbandry. Students enrolled in this science apply their knowledge, skills, and technologies to grow intensively produced plants for human food and non-food uses and for personal or social needs. The students work involves plant propagation and cultivation with the aim of improving plant growth, yields, quality, nutritional value, and resistance to insects, diseases, and environmental stresses. Our farm was started in 2013/2014 school year in response to our students and home school families. Our goal is to provide valuable hands-on training and theory in Best Management Practices, which can mean small-scale, larger-scale organic or even conventional farming. Our students will be participating in many field trips to local working farms including the working UCSC farm and the Cabrillo College Farm. 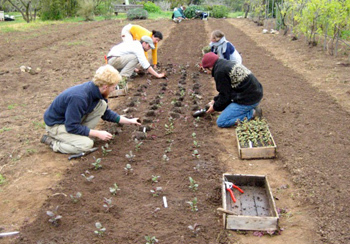 What will you really learn to do at Cabrillo College that will help you with a new career in Horticulture? We specialize in many things horticultural but we focus on growing plants and sustainable landscaping. If so, we have one of the regional experts on staff teaching propagation. Kathe Navarez is an expert in propagating CA natives, salvias, and most anything else you are interested in. She has published research articles on propagation techniques in the International Plant Propagators Society publication. We have a specially designed greenhouse with bottom heat, fog and a solar accumulator for fog timing. There are lots of career opportunities in nurseries, greenhouses or producing seeded vegetable transplants for large farms. We have a fully operational CCOF certified organic farm. It may be small but packs a big punch. We use the farm to teach farm management as well as pest management and marketing. We focus on commercial applications of Best Management Practices and grow the important crops in our area. Our instructors have over 50 years of combined farm experience including research and consulting. We offer enterprise opportunities as well. Careers include growing crops, marketing crops, sales positions in materials used on the farm, packing and logistical support as well a farm advisors, organic inspectors and USDA jobs. What is bugging you? You will learn to identify pests, diseases and weeds, know their life cycles and common methods of control, including biological or chemicals (both organic and inorganic). Our pest management classes can lead to careers in IPM, Applicator license, or even a PCA. Controlled Environment Agriculture (hydroponics and aquaponics)? This expanding field brings together the greenhouse crop production careers with food production. We have 3600 sqft of greenhouse space dedicated to growing food crops in controlled environments. Organic aquaponics is well represented with 2 working systems. Our tomato crop runs from June 30- June 1 and yields over 175 pounds per week of vine ripe tomatoes. There are lots of empty greenhouses in our area and the trend is to fill them with edible crops, so a career in growing food indoors is a great possibility. There are over 1 million acres of food being grown under cover in the world, so you can go anywhere in the world and grow crops. Sustainable Landscape Design and Installation? Concerned about proper plant selection and hardscaping materials for landscaping in a dry climate? We offer a series of classes that focus on sustainable materials, construction and irrigation management as well as designing beautiful landscapes. Students have the opportunity to design several landscapes for real clients. Classes may lead to a career as designers, installations, water auditing, landscape maintenance or edible landscaping. Container Crop Production or Floriculture? We have over 6000 sq ft of nursery production facilities that grow crops from Salvias and CA natives to beautiful sun or shade perennials, bedding and cut flower crops and beautiful flowering baskets and edible perennials and transplants for our Mothers Day Sale. Our classes oversee the production of many our crops and students can have an opportunity to manage a crop if they apply themselves. Course work can lead to grower jobs, propagation, marketing, sales, quality control or research.